Click IT Services are proud to offer the entire Dell range of product, including Servers, Notebooks, workstations, networking and storage equipment. From a single workstation through to a complete network installation comprising of 10 servers and 400 workstations, Click IT Services can add value and benefit to your next hardware investment. We provide the right service at the right right time for the right investment. 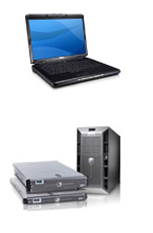 As a Click IT Services client we can managed all of your requirements with Dell hardware and software. So there will be no more waiting and being on hold on with Dell. Just call us and we will manage it all for you.